Whether you’re looking for the perfect seashell, a great place to build a sandcastle, or the perfect backdrop to relax, or a romantic place to enjoy the breathtaking sunsets; Captiva Island beaches offer them all. Shelling is fun for the whole family, and Captiva Island has a vast variety of shells to explore, admire and collect. Captiva Island is an island that is literarily made up of seashells, created over thousands of years and is considered one of the world’s best islands for shelling. The geography of the island lies east to west, rather than north to south, which allows an abundance of seashells to accumulate on Captiva beaches from the Gulf of Mexico. The prized and highly sought-after Junonia Shell can be found on Captiva Island beaches. Previously housing a sea snail, this white shell, with distinctive spiral and brown spots, is “the” shell to find. While enjoying your search for prized-shells and simply unique shells, you may stumble upon beautifully built sandcastles, too! 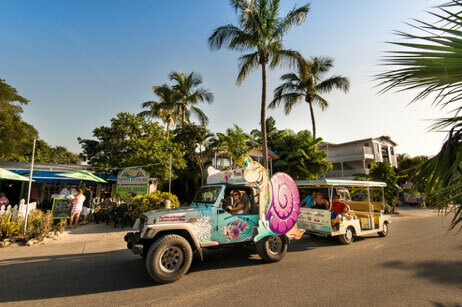 If exploring the island on land is more appealing to you than by water, Captiva Island offers many ways to get around. You can rent scooters, bicycles or golf carts, to name a few. While touring the island you can expect to see exotic wildlife, historical buildings, dine at delicious restaurants and enjoy spectacular views of the Gulf of Mexico. The Captiva Island Inn also offers free rides to local restaurants on our S CAR Go trolley. Inquire at the front desk as to availability.